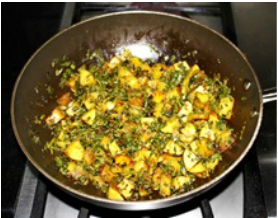 Aloo Methi is an everyday recipe, it is very simple and tasty. Fresh Methi leaves are available in winter time, but in summer you can use dried methi leaves (Kassoori Methi) its available in market. Cut aloo(potatoes) in medium sized cube, heat oil in a non-stick pan. Add cumin seed, asafetida to the pan after cracking cumin seed add potatoes and sauté with high flame till change the golden in colour. After that you add all spice and toss well. Add fenugreek leaves (methi) mix well reduce heat, and cover it. Cook two-three minutes. Aloo-Methi vegetable is ready transfer into serving dish. Serve hot with chapattis, paratha, purees etc.